We have added 3 new domain extensions that can now be purchase through SGIS. Search for domain name. .co domains are intended for global use. .eu domain’s are the top level domain for the European Union – ideal if your target audience is based only in the EU. 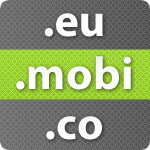 .mobi domain names are for site’s that have been created for mobile phones only. Even if you didn’t want to use these domains as a primary domain to be hosted it might be worth securing them or use them to forward to your existing site. For example you could forward yoursite.mobi to the area where your mobile site is located or simply forward yourdomain.co to your existing site.